We have been rescuing files from broken Maxtors since our earliest days as a centre of excellence in 2003. Their products were famous in the early 2000s for the ease with which PCB problems could be resolved with simple swaps. This useful characteristic faded by around 2004 when unique firmware characteristics started to be stored on each PCB. Today, we continue to see excellent rates of recovery on this well known brand of hard disk using much more advanced techniques, although their hard disk drives are now Seagates in everything but name. Maxtor Corporation was at one point the largest computer storage manufacturer in the world and was bought by Seagate in 2006 in a US$1.9 billion deal. Seagate chose to continue the Maxtor brand for the budget end of the market for both internal desktop and external drives. One give-away of the merger is that the hard disks inside Maxtor external enclosures have Seagate labels. Maxtor themselves bought Quantum’s business in 2000. In the months following each of these major acquisitions, there were drives manufactured by one company, but badged with another. This makes it slightly more difficult to trace parts for hardware-damaged Maxtors from 2000 and 2006. The success of Maxtor as a company means that there are many hard disks performing sturdy service in their name. It also means that a lot of drives that we see are Maxtors, albeit not as high a percentage as five years ago. Maxtors built after 2006 are likely to be Seagates and follow the failure characteristics of that manufacturer. In common with other manufacturers, Maxtor (Seagate) warranty their disk drives but never provide guarantees, compensation or free retrieval for the user files contained in them. What Type of Problems are You Likely to Encounter with a Failed or Failing Hard Drive? Despite the Maxtor technology now being some years behind that used by today’s hard drive manufacturers, most of the likely problems are as prevalent now as they were when Maxtor ruled the roost. This will typically result in limited or no access to some of the data on the drive. Usually this is a result of the degredation of the platters inside the drive. It is often age related. Once this problem has appeared the number of bad sectors will usually accelerate quickly leaving the drive inaccessible without specialist expertise. The failure of the read/write heads will leave a drive spinning-up but without access to the vital user data. Repeated clicking sounds from the heads will usually also be heard (although it is important to bear in mind that these particular symptoms may have causes other than head failure). Similarly the motor which spins the data platters inside the drive can become seized, preventing it fom spinning-up. Typically a short beeping sound will be heard repeated every second or so as the drive tries, but fails to spin the platters. Getting your data back from a hard disk that has suffered internal mechanical failure requires expert experience and specialised equipment. Did you accidentally plug-in the power connection to your hard drive the wrong way around? Perhaps you were simply unlucky and your disk is no longer accessible after a power cut or local electrical storms. You are not alone, this is one of the more common forms of hard drive failure that we deal with. Almost invariably the Maxtor will not spin-up. You may even find that your computer switches itself off automatically as long as the drive is connected to the power supply. Firmware is a small amount of code stored on the hard drive itself which it uses as its own mini operating system. It needs this code to get itself started and to present itself to your computer as a coherent storage device. This firmware can become corrupted, typically when this happens access to the user data (your files) is lost. The symptoms of firmware failure will vary depending upon precisely which part of the firmware has been corrupted. Investigation of this possibility is critical before an accurate diagnosis is reached because a firmware failure will mimic other failure causes. In order to regain access to your critical information on the drive the failure must be correctly deduced. Here at Tierra we have the specialist equipment and experienced personnel to diagnose accurately and carry out the appropriate remedial work in order to re-unite you with your vital data. 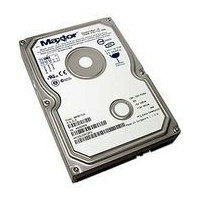 We will arrange the immediate collection and analysis of your Maxtor hard drive. Collection and analysis is FREE of charge for our standard service. We provide an excellent Standard Service (work conducted during office hours) with the option of Emergency Service (work continues overnight and through week-ends). With Standard Service, the analysis is usually completed within 2 working days of our receiving your failed hard disk and means you will know the results quickly. Our long history with Maxtors means that Tierra has the specialist knowledge and equipment needed to ensure the best possible recovery for your data. "Following a mug of tea emptied over the keyboard, the laptop restarted in the sense it lit up , but would not kick in. (You will see I am very IT literate!). A faulty drive was the original diagnosis. Next question, how was my back up? I ended up at Tierra to save the day. The service was quick, was as promised with all explanations easy to follow and understand and more importantly 100% successful. Well done, I have already passed your name on to all the tea drinkers I know."